A very attractive and eye catching display system utilizing a loop of printed graphics that continuously rotates. Advertising messages are constantly changing drawing attention to the display. Replacing the graphics is very simple as the top and bottom mandrels are spring loaded and can be easily removed. Suitable for all exhibitions, shop window shows, product sales, promotions…. Industrial / Consumer display turntables are an excellent way of promoting products at shows, exhibitions and other demonstration events. 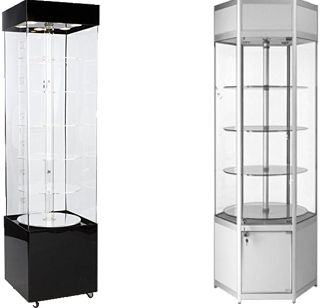 Regarded as the ultimate Silent Salesman, they keep revolving and showing your products in their best light all day long. The revolving stages and platforms our customers require vary widely from small to large, differing in required turntable weights, strength and revolve size. They carry fashion models, automobiles, massive industrial equipment displays, entertainers with monitor mix and side-stage personnel, customized and creative designed spinning artwork and just about everything in-between that can be imagined. While SHALOM have been used by the world’s automobile manufacturers at the leading international car shows, we have also installed our revolving car platforms inside stage sets allowing automobile marketing executives designers to drive their products on the stage, allowing SHALOM vehicle rotation on each side of the stage in only an instant, which permits vehicles to pass both ways on the stage, enhancing and energizing any auto show performance. Vehicles are easily transported on to the SHALOM automobile rotation platforms via our high strength automobile ramps, adjustable for most vehicles.